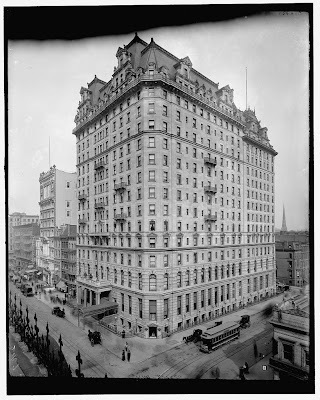 The Manhattan Hotel designed by Henry J. Hardenbergh c. 1896 at Madison Avenue and East 42nd Street in New York City pictured during the first decade of the 20th century. Click HERE for more on the Manhattan Hotel. Photo from the Library of Congress. I do love these florid old mansard roof buildings from back when New York architecture was trying to be Parisian, only taller.